VERY IMPORTANT STUFF TO READ!!! During normal operating days, PLEASE INFORM US if there is a time requirement for your delivery. We can deliver items BEFORE or AFTER a time that you designate. **When using our online system, please provide us with a phone number that you regularly check/use. Without a working contact number for the sender, potential delays/issues may occur. We will not call the recipent and ruin the surprise unless explicitly directed to. ***Please note that the wine bottle in our arrangement photographs is for scale and not available for delivery. 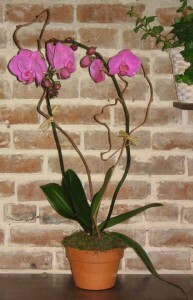 We do things a little differently with our flower arrangement catagories. 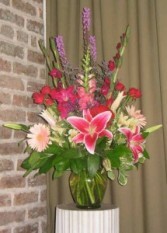 We've been asked over and over to have our arrangements separated by price, rather than occasion. We've come up with "Economical", "Mid Range", and "Wow!" and "Designers' Picks!" we respond that our arrangements are like fingerprints; no two are the same. There are so many ways to do flowers, just like the many flavors of ice cream. *This site is set up exclusively for those who would rather conveniently order on line with a credit card. The convenience fee is added by FlowerShopNetwork.